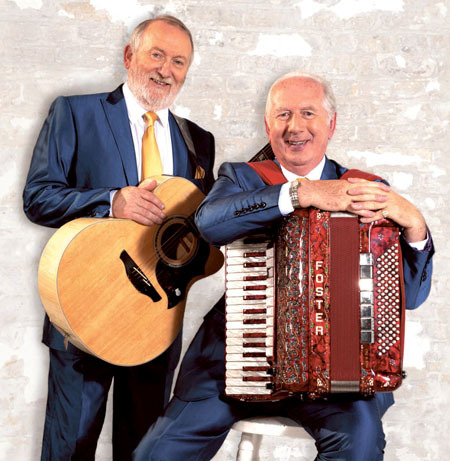 As part of their upcoming summer tour, Foster & Allen will be playing the Carlton Shearwater Hotel, Ballinasloe on August 8. Their brand new show The Ultimate Collection Tour is already wowing audiences across the country as they perform all their hits including ‘Bunch of Thyme’, ‘Maggie’, ‘After All These Years’, ‘Old Flames’, ‘I Will Love You All My Life’, and many more. For over three decades Foster & Allen have continuously managed to scale new heights! Their latest album The Ultimate Collection reached the UK top 40 and is their 30th chart album in 30 years. This year is destined to be an amazing year for Foster & Allen as in August they will be releasing their first ever autobiography Foster & Allen - After All These Years, Our Story through Virgin Books / Random House Books. Tickets available at the hotel reception and through Ticketmaster.